The Grand Master Evolution Series from TARA Labs is truly beyond belief. It is quite simply the new watershed in the art and science of audio cable design. The Evolution Series is in a class of its own, beyond all other audio cable products in the history of the audio industry worldwide. 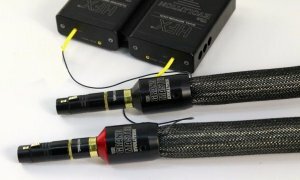 The Grand Master Evolution Interconnect uses the same multi-lumen air-tube concept invented by TARA Labs as used in the ZERO Interconnects and the AIR Series Interconnects originally developed in 1986. However, the Evolution Interconnect is remarkably flexible. Incredibly, the new Grand Master Evolution Interconnect boasts a remarkably low capacitance figure of just 2 pF per foot. This means that the new Evolution has a High Frequency bandwidth that is more than 300% greater than any other high-end cable in the world. Compared to the Zero Evolution, The Grand Master Evolution has a larger, more complex system of Teflon and Aero-PE filaments that ensure a complete air dielectric system.